A Plowshares activist was released on September 12 after serving the majority of her sentence, only to be promptly arrested for allegedly violating the terms of her probation. 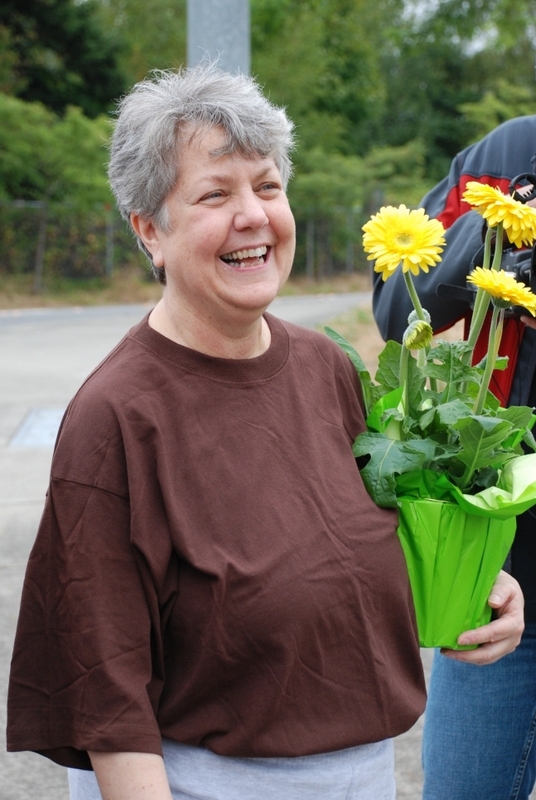 Lynne Greenwald was released earlier today from the SeaTac Federal Detention Center in Washington State after serving five and a half months of a six month sentence for her participation in the 2009 Disarm Now Plowshares action at the Bangor Trident nuclear submarine base and Strategic Weapons Facility, Pacific. Greenwald is a grandmother, retired social worker, peace activist, and until her time in prison worked at Irma Gary House, a transitional house for women recently released from prisons in Washington State. Greenwald arrived at the Federal Progress House (the organization that was to provide community supervision while she is under house arrest for the remaining two weeks of her sentence) before noon as she had been instructed by Bureau of Prisons (BOP) officials. While working through her paperwork U.S. Marshals arrived and arrested Greenwald for allegedly violating her conditions of release. They transported her to a holding cell in Tacoma awaiting transport back to the SeaTac Federal Detention Center this evening. Upon learning of Greenwald’s arrest supporters immediately contacted the U.S. Marshal’s office as well as attorneys working on Greenwald’s behalf. Attorney Blake Kremer said that Greenwald was picked up on a probation violation based on the requirement that she go “immediately” to the halfway house (Irma Gary House). A brief videotaped interview and time spent with well-wishers who went to the prison to meet her are the issue. Greenwald did go directly from SeaTac to Irma Gary House and then on to Progress House where she did what was required by checking in before noon. The marshals were sent by the BOP, not requested by Progress House or Irma Gary House. According to the Marshal’s office generally when Marshals pick up someone for the BOP at a halfway house, the issue is handled administratively and without a hearing. Kremer said that her case could either be handled administratively or through a hearing. A hearing would likely be held tomorrow at the U.S. District Courthouse in Tacoma, Washington. Greenwald and her fellow Disarm Now Plowshares co-defendants, Bill “Bix” Bichsel, SJ, Susan Crane, Steve Kelly, SJ, and Anne Montgomery, RSCJ, challenged the legality and morality of the US storage and threat of use of thermonuclear missiles by Trident nuclear submarines stationed at the Kitsap-Bangor Naval Base outside Bremerton Washington. They entered the U.S. Navy’s nuclear weapons storage depot at Bangor, Washington on November 2, 2009 to symbolically disarm the nuclear weapons stored there, and expose the illegality of the government’s continued preparations for nuclear war. The five admitted from the start that they cut through the chain link fence surrounding the Navy base during the night of All Souls, November 2, 2009. They then walked undetected for hours nearly four miles inside the base to their target, the Strategic Weapons Facility-Pacific. This top security area is where activists say hundreds of nuclear missiles are stored in bunkers. There they cut through two more barbed wire fences and went inside. They put up two big banners which said “Disarm Now Plowshares: Trident Illegal and Immoral,” scattered sunflower seeds, and prayed until they were arrested at dawn. Prosecutors said the government would neither admit nor deny the existence of nuclear weapons at the base and argued that “whether or not there are nuclear weapons there or not is irrelevant.” Prosecutors successfully objected to and excluded most of the defense evidence about the horrific effects of nuclear weapons, the illegality of nuclear weapons under US treaty agreements and humanitarian law, and the right of citizens to try to stop war crimes by their government. After difficult deliberations the jury finally found all five co-defendants guilty on all charges of Conspiracy, Trespass, Destruction of Property on a Naval Installation and Depredation of Government Property. The five co-defendants received varying sentences including up to fifteen months confinement. Naval Base Kitsap-Bangor and Strategic Weapons Facility, Pacific represent the largest concentration of operational nuclear weapons according to the Kansas City Star. The U.S. is currently working on plans for a new fleet of ballistic missile submarines to replace the current Trident fleet. The new fleet armed with nuclear armed missiles would operate through the year 2082.